If you are looking for an easy and tasty idea for meatless meals for Lent, this is one that we recently tried and really enjoyed. It will become a meatless staple for us. Add diced tomatoes and vegetable broth. Stir in fresh basil, Season with salt and black pepper, to taste. Simmer on low for 15 minutes. Remove the bay leaves from the pot. Use a hand immersion blender to blend the soup (or carefully transfer soup to a blender to blend and return to the pot). Stir in sour cream until well combined. Stir in the cheese tortellini and cook on medium-low until tortellini is cooked, approx. 8 minutes. Serve warm. February 20 marks the anniversary of the date of the death of Jacinta Marto, one of the Fatima seers. Jacinta and her brother Francisco were the youngest non-martyrs to be beatified in the history of the Church. 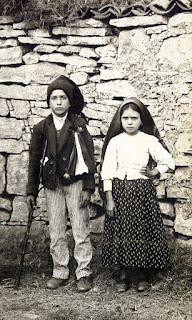 The brother and sister, who tended to their family's sheep with their cousin Lucia Santo in the fields of Fatima, Portugal, witnessed the apparitions of Mary, now commonly known as Our Lady of Fatima. We are approaching the 100th anniversary of the apparitions which will be commemorated next year, 2017. Thinking of Fatima and its upcoming centenary, I wanted share some ideas for this feast of the Bl. Jacinta and Francisco. My husband’s family is Portuguese so I like to try to learn some of the common dishes associated with the country and culture. Portugal is known for its rustic peasant style cooking – food from the land. It is simple and doesn’t take much equipment to prepare, but it is always flavorful and comforting. As Bl. Jacinta and Francisco were shepherds the peasant foods like this would likely be common for their family. Caldo verde, or green soup, considered by some as “Portugal's national dish” is a homey dish of potatoes, thinly sliced kale, and smoky pork sausage. Linguica is the preferred Portuguese sausage if you can find it. I was able to get it at a specialty meat market. Readers often mention looking for healthy recipes for feast days. With kale being such a current super food, high in organosulphur compounds, vitamin A, vitamin C, B6, manganese, calcium, copper, and potassium. I hope you find this addition one for the healthy (and hearty) category. Bring a saucepan of water to a boil over high heat. Prick the sausages with a fork and add to the boiling water. Boil for about 5 minutes. Using tongs, transfer the sausages to a cutting board and, when cool enough to handle, slice them. In a medium soup pot, heat 3 tablespoons of olive oil, add onions and garlic and cook for 2 to 3 minutes until tender and translucent, but not browned. Add potatoes, water and salt. Cover and boil gently over medium heat for 20 minutes. Meanwhile, in a skillet cook sausage slices until most of the fat is rendered out. Drain and reserve. Scoop out about 2 cups of the potatoes and mash well. Return potatoes to pan, add the sliced sausages and simmer about 5 minutes more. Add the greens, stir well and simmer, uncovered, stirring occasionally, for 3 to 5 minutes. Do not overcook; the greens should be bright green and slightly crunchy. Season with salt and pepper. Combine the yeast, sugar, and the warm water in a large bowl until the yeast is dissolved and foamy, about 5 to 10 minutes. In a large mixing bowl, combine the cornmeal and salt with the boiling water. Mix vigorously with a wooden spoon to blend. Allow to stand for a few minutes for the cornmeal to soften and cool to room temperature. Add the melted butter and mix to incorporate. Now, pour the yeast mixture into the cornmeal mixture, stirring to combine. Gradually add the flour, mixing well after each addition. Add a couple of tablespoons of water if the dough feels dry and doesn't come together easily. Continue to mix until a dough forms into a ball. Turn the dough out onto a lightly floured surface and knead, adding just enough flour to keep the dough from sticking, until smooth and elastic, about 5 to 10 minutes. Grease a large bowl with oil and place dough to the bowl, brush the top with more oil. Cover with kitchen towel and let it rise in a warm place until doubled in bulk, between 1-2 hours. Preheat the oven to 400 degrees F. and place a pizza stone in the oven to heat up. Put the dough round on the pizza stone and brush the top with oil. Sprinkle the top of the bread with coarse salt. Bake in middle of the oven for 40 to 50 minutes until the bread is golden brown and bottom sounds hollow when tapped. Blessed Francisco and Jacinta, Pray for us! Happy feast of Our Lady of Lourdes! Today we highlight a couple of sweet confections that have an association to the Shrine of Our Lady of Lourdes in France – Ferrero Rocher and Pastilles a l’eau de Lourdes. Last February a few days after the feast of Our Lady of Lourdes, Nutella founder Michele Ferrero died and at that time there were numerous articles circulating about his strong devotion to Our Lady under this title. So this year on the feast of Our Lady of Lourdes, I wanted to highlight that connection. In 1996, at the 50th anniversary of the company’s founding Michele Ferrero is quoted as saying, "The success of Ferrero we owe to Our Lady of Lourdes; without her we can do little." He was a man of strong faith and every year he went on pilgrimage to Lourdes taking his top manager. Each of the Ferrero plants and offices around the world have a small statue of Our Lady. It is said that the company's Rocher pralines, first produced in 1982, were inspired by the grotto at Lourdes. Rocher is translated as rock and the craggy rock formation at the shrine in Lourdes is called the Rocher de Massabielle. It is easy to see how the chocolate's nutty surface resembles a rocky grotto. The other Lourdes associated candy, Pastilles a l’eau de Lourdes, are a Lourdes water lozenge – made from water from the grotto, sugar, and natural flavorings (mint, lemon, or anise). Similar candies have a very lengthy history, having been produced in Lourdes since 1888. The original pastilles are imprinted with a figure of the Virgin Mary on one side and ‘A L’EAU DE LOURDES’ (‘contains Lourdes water’) on the other. The current candies back imprint is ‘Malespine’ which is the factory. We bought some while we were in Lourdes a few years ago, but they are also available online and through many religious goods outlets. February 10th is the feast day of St. Scholastica, foundress and sister of St. Benedict. This year her feast falls on Ash Wednesday so is a day of fasting. I had an idea for her feast day based on the story I shared last year about her association with thunder and lightning. This cake idea comes from a much loved children's picture book which has been a favorite of mine for years - Patricia Polacco's Thunder Cake. In the story a little girl, afraid of an upcoming thunderstorm, is distracted by her grandmother as they find ingredients to bake a "thunder" cake. The book includes the recipe for a version you can do yourself. I love the book for its story as well as the depictions of holy images (icons) in the home of the Russian grandmother - so lovely. But since her feast this year falls on Ash Wednesday, Shrove Tuesday would be a great time to make this cake and "use up" the eggs and sugar and such, which would have been common in earlier days as preparation for Lent. So this is a way to both prepare for Lent and also to celebrate St. Scholastica the day before her feast. Pre-heat oven to 350 degrees. Cream together one at a time the shortening, sugar, vanilla. Blend yolks in. Beat whites until they are stiff, then fold in. Blend in water and tomatoes. Sift together the flour, cocoa, baking soda, and salt. Mix dry mixture into creamy mixture. Bake in two greased and floured 8 1/2 inch pans and bake for 35 to 40 minutes. Frost with chocolate butter frosting. Top with strawberries. With Lent starting next week, it is a good time to talk about those food related days preceding. The Monday before Ash Wednesday has a variety of names: Rose Monday, Shrove Monday, Merry Monday or Hall Monday (short for "hallow" – holy). Another name is Collop Monday. It is rather overlooked these days while Shrove Tuesday gets all the focus. The collops for which it is named, refer to slices of meat, often cured meats such as bacon. Collop Monday was a last opportunity for eating meat as well as eggs and butter which weren't eaten during Lent. Any fresh meat still available would be sliced into steaks and salted to preserve it until the end of the period of fasting. A traditional meal would consist of thick slices of bacon along with eggs. The remaining fat was often kept for making pancakes the next day, on Shrove Tuesday. Our family doesn’t need any excuse to eat bacon or ham, but if there is one, all the better. Consider reviving this Collop Monday tradition this year in preparation for the start of Lent.